Focus supports what I do as an Australian Textile Artist. Firstly, what is the antithesis to focus? The Butterfly Effect! Think of a beautiful, jittery butterfly, fluttering from one flower to the next, having a great time, but not focussing on just one, sublimely beautiful flower. Why am I even writing about this? Because I believe all successful people have mastered the art of focus. Focus magnifies our effectiveness. 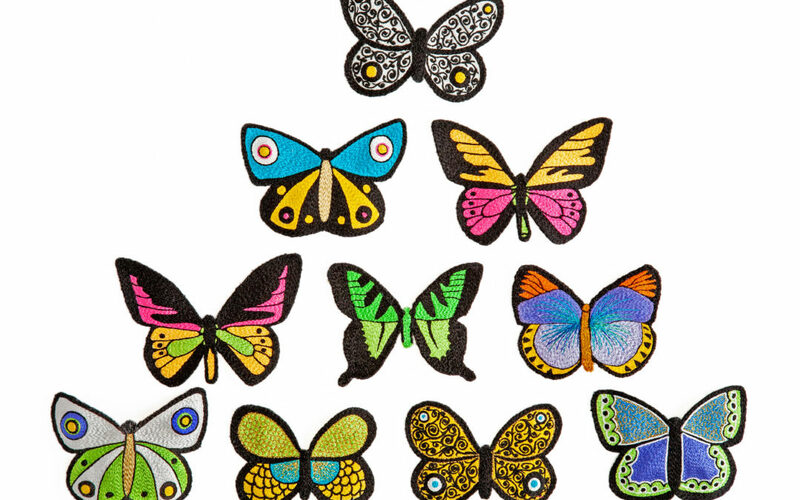 Have you heard of The Butterfly Effect? 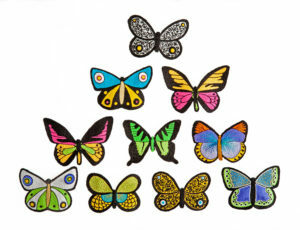 I read about The Butterfly Effect years ago in an English embroidery magazine. I wish I could remember the author to acknowledge her, because her words and rationale totally resonated with me. The Butterfly Effect ensures the complete and utter lack of focus and direction, in my opinion. Why? Because too many ideas, techniques, materials are on offer, all fighting to be used. I’ve looked at artist’s work I admire and one commonality throughout, is their effective use of focus and direction. They have developed a style which is invariably simple, technically proficient and artistic as well as being easily recognisable as their own. Numerous techniques, ideas and materials may have been sampled to achieve that outcome and may again be used to move their work forward, but at the end of the day, they remain within the boundaries they set themselves to achieve their desired outcomes. That’s focus. Direction comes from continuing that focus; seeing where it will take you. That’s the icing on the cake – and that’s both powerful an exciting! Know yourself! How and when do you like to work? What is most efficient for you? I use ROUTINE and HABIT to consolidate what I need to do each day. I’m a morning person, so I use this most productive time to plough through the things I really need to do while I’m mentally and physically fresh. This is the time I deal with emails, write a post for my blog, prepare dinner, exercise and pay bills. Each day I have a mental picture of what needs to be done. I don’t write endless notes, I know what I need to do – and I do it. Only after this has been achieved, do I head down to work. Working as a textile artist, doing what I love, is the lure. I like to have my life organised before I take one stitch. It’s routine and habit that gets me through. I have a daily, weekly, monthly and yearly routine – and I really try to stick to them without even thinking. One of my weekly routines is to tidy my workroom every Saturday. Must admit, during an unusually busy time recently, I let that slip. It’s caused complete and utter chaos. I’m not perfect. Life sometimes gets in the way! I’ll get back to my Saturday routine along with the mantra ‘must put away, must put away, must put away’. The most important things is to get back to what you know works, asap! Another way to focus is to learn to SAY NO to unwanted distractions and interruptions and learning what they are. Haven’t quite mastered this yet. It’s hard. I’ve really had to question what I want to achieve and what I need to do to make that happen. Learning to say no has become a part of that and is a part of me managing me – not someone else managing me! Sometimes it’s difficult working from home. Sometimes people think you can just drop what you’re doing, but I’m learning to prioritise different aspects of my life. I’m still a work-in-progress on this one. PLANNING is hugely important to achieving focus for me. If I commit to exhibit, teach, go out with friends or attend a meeting, I need to plan for that, ensuring I also maintain other deadlines and commitments. I don’t like letting myself or other people down. Horror of horrors! That’s why my MAGIC CARD SYSTEM works so well for me, supported by my BULLET JOURNAL and my YEAR AT A GLANCE system for paperwork. This way, I know what I’m committed to, when it will happen and where the supporting paperwork is. Plus, my MAGIC CARD SYSTEM is in front of me each and every day. I can’t ignore it! That’s very powerful magic for me. ORGANISE, organise, organise! I love systems and have learnt how important they are. Systems are an efficient and time-saving addition to my life. They help me achieve focus by making my life easier. For instance I now have a system for filing images as soon as they’re taken as well as adding all relevant information about the work directly onto my Art Inventory. If and when needed, it’s as simple as opening a file and pressing a button. Job done. That leaves me more time to design and stitch, so that’s a good thing for me. A new addition this year has been my YEAR AT A GLANCE system for paperwork. Yes, I have a filing system, but this works better for me. It’s visible, easier to access plus I can move it around where I work. It’s simply a large piece of foam-core I pin all relevant paperwork to. I also use it to keep drawings, design inspiration and ideas and exhibitions I might like to attend. Yes, it’s old-school, but it’s visible and that’s what I need! Be mindful. Look after you! Finally, is there such a thing as MINDFUL CREATIVITY? There is now. It’s amazing to be able to do what I love and I’m extremely grateful. However, there has to be a down-time, a time to relax, laugh and re-charge. It might be as simple as a walk in the sunshine (or the rain) or watching a movie. Sometimes I just need a time-out. Invariably, I come back refreshed and re-focussed. It works for me. It’s often these down times, when great ideas come to the fore as your mind is relaxed and open. Win-win! Use focus! I love it.